My husband tells the story of his childhood in Saskatchewan, where at Christmas powdered eggnog mix was available. He recalls that when made up into a drink the stuff was terrible, but alone on a spoon, as a kid this stuff was heaven. 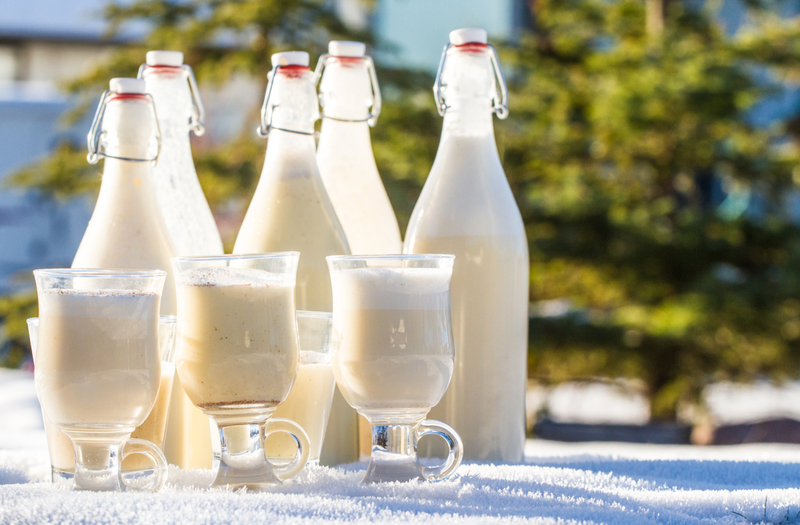 At Christmas eggnog comes along side the milk and cream in the dairy section, while quantities last, but the drink isn’t really very real tasting. So this year, for the holidays, our family decided to do a comparison of some recipes for home made eggnog from scratch. I chose recipes using different techniques to see which our family and friends preferred. Three with the basics: egg, cream, milk, sugar, vanilla and nutmeg. And two with additional extras. 1. About Food offers a recipe for a cooked eggnog using whipped cream as the frothiness. The recipe says it takes 65 minutes but the actual requirement is to let the custard chill for at least 4 hours, so I would say make it the day before. I found this recipe the most time consuming of the bunch. 2. 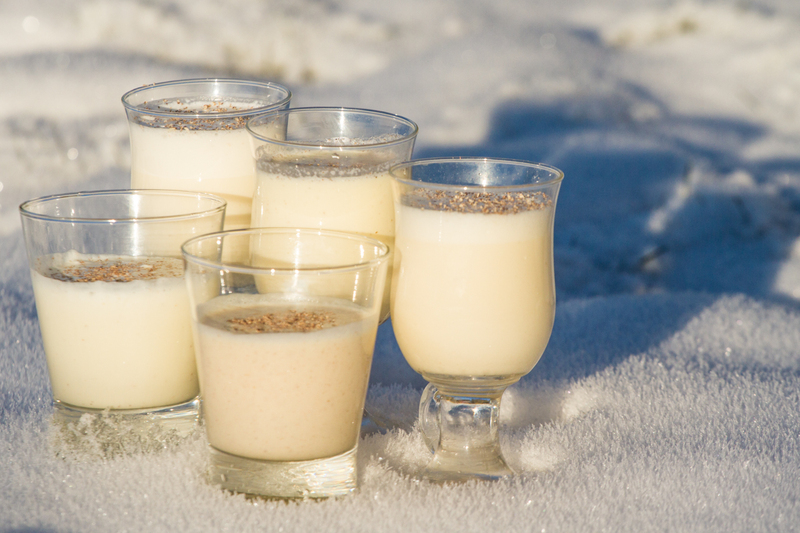 Spice and Foodie has a recipe called Hubby’s Old Fashion Eggnog that is made cold and then chilled. This is by far the easiest recipe, also the thinnest as it doesn’t use whipped cream, egg meringue or custard for thickener. 3. Instructables.com gives a recipe that combines yolks with milk and spice (booze is optional so we omitted it), and then folds this into beaten egg whites to create a whipped thick nog. The egg whites give a fluffy texture, and add the thickness. 4. All recipes.com used two additional ingredients: condensed milk and salt in an uncooked version of eggnog. This one uses whipped cream for thickening. 5. A Sweet Pea Chef adds cloves and cinnamon to the mix in a cooked eggnog recipe. This is the thickest recipe of the bunch, and the most cooked. The addition of the other spices does change the final flavour. 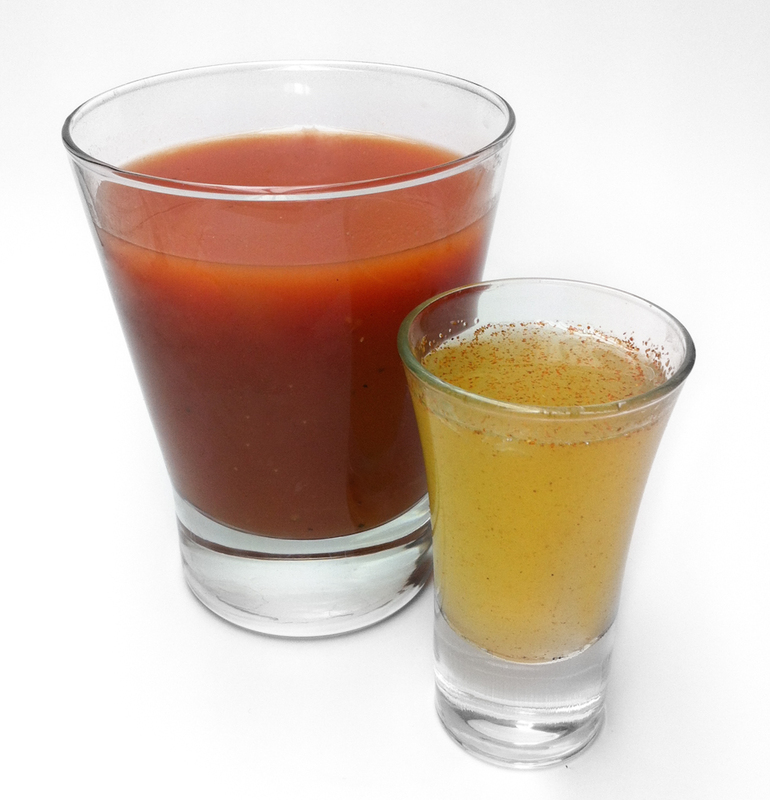 Eggnogs are supposed to be thick. But how thick? The cooked eggnogs create a custard that becomes the thickening factor. I found that the Sweet Pea Chef recipe(#5) almost too thick, while the Spice and Foodie recipe (#2) could have used some thickening. As far as taste – the most nutmeg flavour was in the Spice and Foodie recipe (#2) calls for a full teaspoon of fresh ground nutmeg in it’s recipe. The only other recipe asking for the same amount was the Sweet Pea Chef recipe (#5), but there two other spices blend for the flavour profile. The cooked About Food recipe had a cooked egg flavour reminiscent of tapioca pudding. The nutmeg taste is enhanced with the addition of the recommended garnish, but personally I would recommend doubling the amount in the recipe as well. Others who sampled this found this was their preferred option, saying that for those who do not normally like eggnog, this is the better one. That must be so, because my eggnog hating daughter loved this recipe. We found the Sweet Pea Chef recipe also very cooked in flavour, and the no one preferred this choice. My husband said the combination of spices remind him of pumpkin pie and that this could be very good mixed with something. My friends suggested it would be excellent on Christmas deserts. For a drink, we gave it a couple days and tried it again, diluted with milk (half and half, or just a bit less milk if we wanted it richer). The flavours had blended and the drink was much more eggnog like. When it comes to simplicity the Spice and Foodie (#2) recipe wins, but for flavour and thickness the competition is between AboutFood’s recipe (#1), Instructables recipe (#3) and AllRecipes.com (#4). While I liked the cooked version, as a eggnog fan the recipe #3 wins out for thickness and flavour. 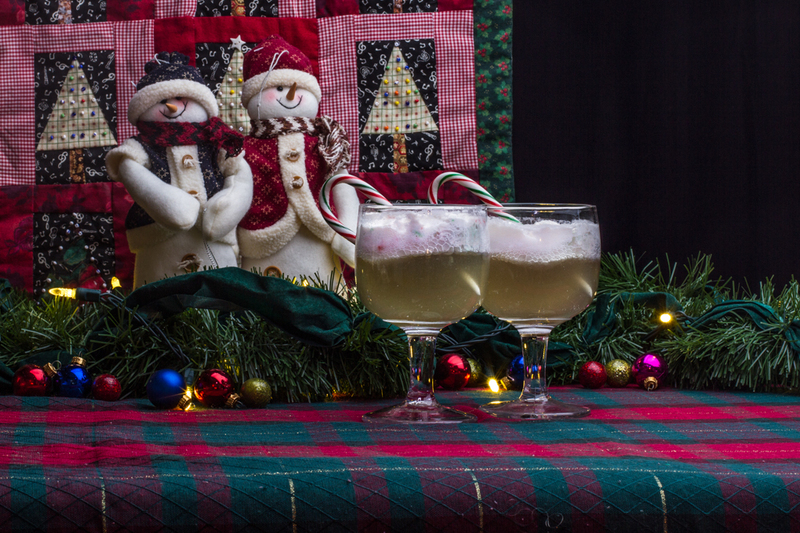 The addition of egg white meringue makes this recipe very frothy, light and flavourful, while adding whipped cream in recipe #1 and #4 increases the richness tasted in the beverage and competes with the flavour of the nog. Interestingly, the meringue thickened recipe (#3) has the most whipping cream in the recipe of all the five tested! Guess that goes to show what whipped egg whites can do. The winner of the tasting challenge was #1 with the most votes. The cooked quality was great for all ages, and the taste is preferred by even non eggnog fans. Second and third go to Instructable.com and Spice and Foodie, each having advantages over the others. If I was to host a party and look for a recipe to serve, I would go with the recipe from Instructables.com, which is fairly simple to make doesn’t require cooking and cooling, or tempering over time, and has the great frothy look from the meringue. For giving as gifts? I would choose the safest approach and go with the winner. And for home, just to have and enjoy any time? The Spice and Foodie recipe since it requires little time and no additional ingredients. That being said, I would probably pick up a whipping cream bomb and add a dollop of whipped cream and a dash of nutmeg to the glass and then Cheers and Happy Holidays! Black Forest Magic Tea. Add a bit of sweetness and it’s delicious. The Black Forest is in wooded mountain range Baden-Württemberg, southwestern Germany. In history this area was known for it’s mines, hardwood and clocks and chocolate. While the clocks are still known today for their precision, it’s the Black Forest Cake invented in these mountains by Josef Keller, that is most famous. The blend of chocolate, cream and cherries with Kirshwasser gives the cake it’s name: Schwatzwalder Kirschtorte. According to the Kitchen Project the cake features one of the area’s main crops: cherries, in both the use of the fruit and the Kirsh a double distilled alcohol produced from cherries. 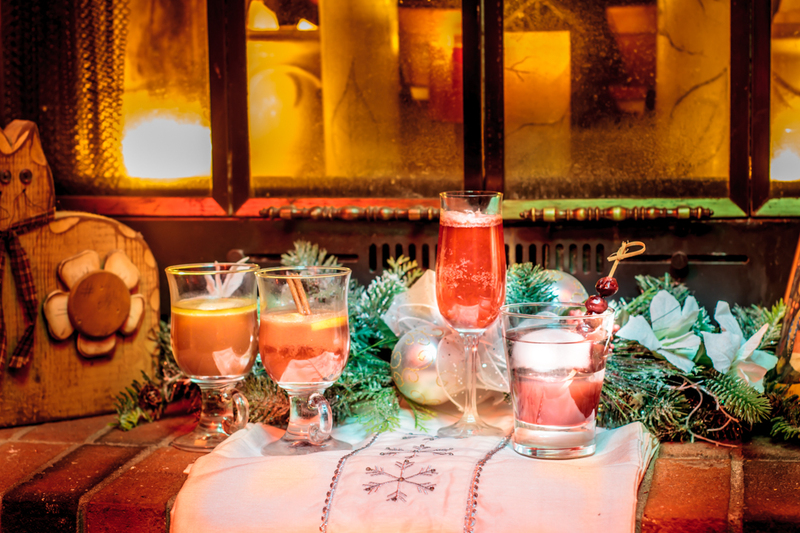 Cocktails, hot chocolates, shakes, martinis and shooters have all been inspired by this cake, some using the original concept of cream, cherry liqueur and chocolate and other blending other ingredients into the mix or choosing alternative takes on each. 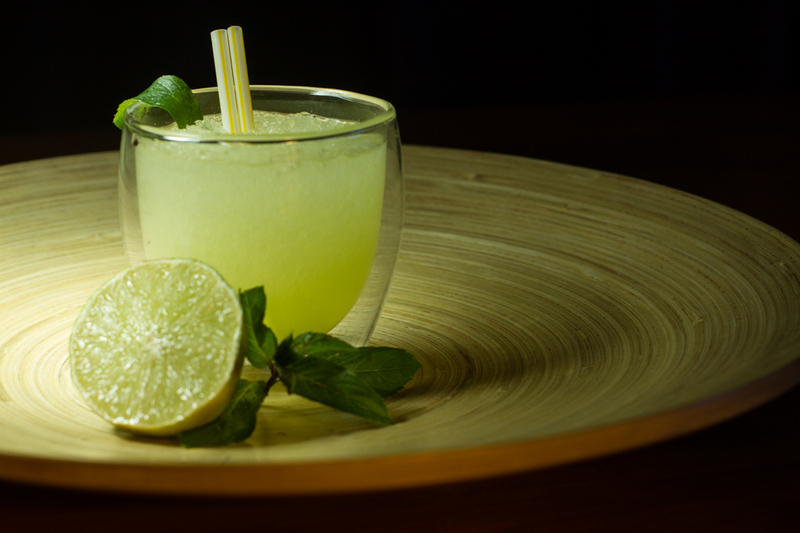 Most of these use some form of liqueur in the mix. 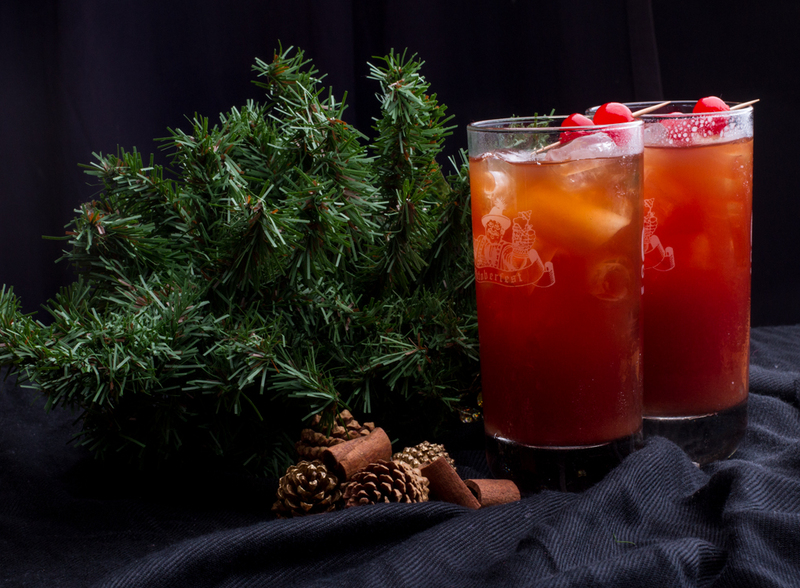 Mother Earth Living posts a Black Forest Magic iced Tea that blends cocoa powder, cinnamon and tea in an infusion that is blended with cherry juice and served cold over ice. I tried the recipe and found it very interesting but not sweet enough for my tastes. Without a superfine strainer or specialty tea bags I found that the ground ingredients remained in the water, reducing the clarity of the drink. This is definitely a tea though, with the dominant flavour coming from the tea leaves. So since I like tea with milk and sugar, and since Black Forest Cake calls for whipped cream, I added a splash of milk and an oz of simple syrup to each glass and stirred. The result was an iced tea latte with the original flavour complex of the black forest tea, with a note of creamy sweetness. Yum. What did my kids think? They were also not big fans of the original drinks, but with sugar the kids enjoyed the flavour. Kid-o-metre 5/5 kids loved this! Simplicity: 2/5 needs specialty equipment to keep the tea clear. Ingredient finding: 3/5 in Tumbler Ridge – I had to be creative with the cherry juice.